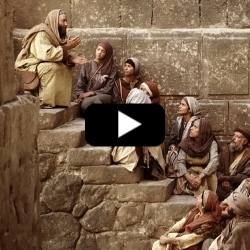 In this video of events after the death of Jesus, Paul continues to teach the people in Ephesus, and he teaches them important doctrine (teachings). He teaches that there is “one Lord, one faith, one baptism” (Ephesians 4:5). By this, Paul is saying that there should not be many modes of baptism. Some sprinkling, others somewhat immersing their bodies in water and some fully immersing their bodies. There is one form of baptism. If we watch the baptism of Jesus, we can see the true form of baptism. The scripture also talks about “one Lord”. There is one Lord and Savior Jesus Christ. Not many Greek gods or other idols that should be worshipped. Jesus Christ is real, He really lived; He is the Son of God. Only in and through Him can we repent and return to live with God for eternity. One of the scriptures in this video says “But unto every one of us is given grace according to the measure of the gift of Christ”. In other words, if we believe in Jesus and accept Him and His sacrifice and repent of our wrongdoings, we can return to live with God. The grace of Jesus is a free gift to all of us. Everyone who has ever lived, whether good or bad will be resurrected (John 5:29). Grace means mercy; it means power given to us from God. It means that through Jesus we can reach a higher level. We can achieve what we couldn’t without Him. In other words, all humans will be resurrected and have immortality (they will never die again). All who repent will be forgiven of their sins. Because of the grace of God through Christ, if we believe in Him and repent, we can return to celestial glory for eternity. All churches are good if they help their members to believe in Christ and come closer to Him. So, what does “one faith” mean? In 1820, a boy had a question - which of all the churches was true. He prayed and God and Jesus came to earth to visit him and through him (years later) they established the Church of Jesus Christ again on the earth. It has the priesthood of God given by an angelic visitation from Peter, James and John. There are apostles and prophets in Christ’s Church today. There are temples where husbands and wives can be bound together forever in eternal marriage by the power of the priesthood of God. To learn more about these things and the church that was restored that was established by Jesus Christ Himself, request a visit from the missionaries.